I’ll start with one I watched this morning (now yesterday!) – when it was shared by my Facebook friend, Scottish singer/songwriter Roddy Hart. This video actually dates back to January, but this morning was the first I’ve seen of it, and, well, it made me laugh so hard, I had tears in my eyes,…so I thought it worthy of a share today. Another viral share that’s been making the rounds this weekend was both fun and educational. There were some great maps in this collection of 40. I personally liked the one about Mississippi. (Every time I write that word, or even say it, I spell it out in sing-song way – any fellow Americans will do it the same way, I suspect). HELLO FACEBOOK YOU’RE MAKING US MISERABLE! This next one is not humorous or entertaining – but it did catch my eye and resonate with me so I thought I’d include it here too. It’s about Facebook, the social media platform that I, personally, have a sort of love/hate sort of relationship with. Anyway, as I am in the process of setting up my new One Day, Basic WordPress website training aimed at SMEs who need a little hand-holding, I thought I’d leave you with an infographic showing its popularity. 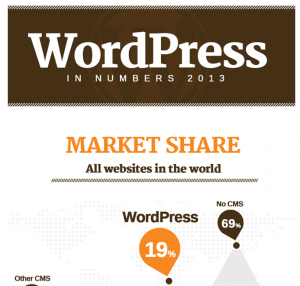 It appears that one in three adults in the US have heard of WordPress (according to the #WCSF keynote I listened to last week) but for those of you who don’t know, it’s a Content Management System (CMS) for websites. They have a staggering future (see their “anticipated growth” section of this infographic!) And some of the biggest websites in the world utilize their platform. Previous post Geez! How Hard is Naming A New Company?